Today I want to take a closer look at the relevance of heterosis in Jatropha breeding. Heterosis or hybrid vigor, or outbreeding enhancement is “the increase in growth, size, fecundity, function, yield, or other characters in hybrids over those of the parents”. Find more information on heterosis on Wikipedia. Almost 3 years ago we started all our breeding efforts from this genetic variability map created by our friend and advisor Tommaso Barbi working at Geneticlab in Trieste, Italy at the time. The parental accession base of the Bionic Palm Jatropha breeding program is not a 100% overlap, but we do have quite a significant number of key accessions in our program which are also shown in the map while many others can be linked to one of the clusters genetically or phenotypically. Simply speaking, crossing more distant accessions from the map increases the likelyhood of significant variability in the hybrids genetically expressing itself in a higher degree of heterozygosity. Another crazy insider term from molecular biology, I know. Heterozygosity describes the amount of differences between corresponding alleles in a DNA sequence. Homozygosity is the term for the opposite situation of corresponding alleles being similar. It has been found that heterozygosity usually correlates with strong heterosis effects. In the map above a cross between more distant accessions leads to a higher heterozygosity in the resulting hybrids and therefore higher levels of heterosis can be expected. Only about 6 months ago we started to be able to observe different heterosis levels in our hybrids. The molecular basis of heterosis is still not fully understood. Current believe among scientists is that healthy alleles across numerous genes from one parent compensate for dysfunctional alleles at those genes from the other, distantly related parent (and vice versa for a second set of genes). A plant exhibiting a high level of heterosis would thus be the genetically most healthy. This explanation fully corresponds with the opposite effect of inbreeding depression. Here parts of the parental alleles become dysfunctional or silenced because there is too little genetic difference between the two parents. The very strong expression of heterosis we observe when crossing a semi-commercial Jatropha accession from Africa or Asia with a wild accession from the center of origin therefore suggests at least a mild inbreeding depression on a very narrow genetic variability in the germplasm originally introduced by the Portuguese seafarers when they first distributed Jatropha around the world. So far observations are limited to leave size and, at a smaller extent, stem diameter. Over the coming month fruit and seed sizes will become visible too. With the leaves we quite commonly measure lengths of up to 20cm where the usual average is no more than 10cm. The following picture demonstrates the phenomenon very clearly. 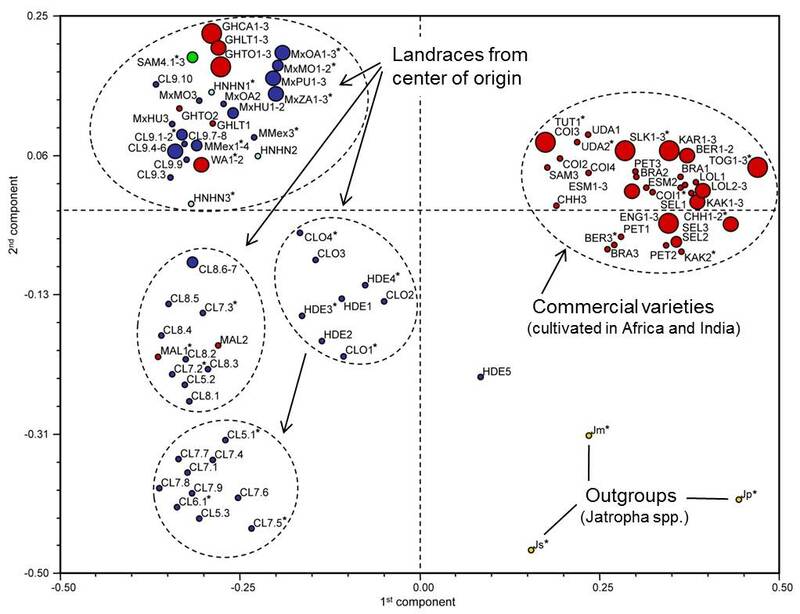 The small plant in the front germinated in November 2011 and is a cross of 2 accessions with distinct phenotypic differences but, genetically very similar, they are both from the upper left cluster in the map. 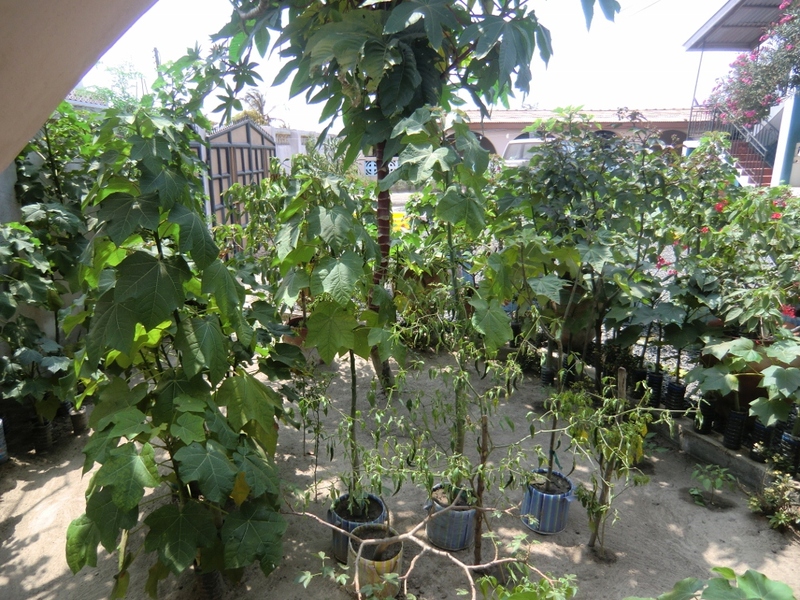 The much larger plant behind in the center germinated in March 2012, 5 months later, and represents a cross between the upper and lower left hand clusters. Average leave length is almost double that of the plant in the front and of course the overall size is significantly different. A heterosis effect is also visible in many of our interspecific hybrids, but notably less so in those which have a very short seed-to-seed time of less than six months. A behavior which can be attributed to negative heterosis (=shorter seed-to-seed cycle). Interspecific heterosis can be observed in the following picture. The plant on the far left hand side shows by far the most dramatic heterosis effects. Followed by the next 2 plants to the right with heterosis also clearly noticeable. All 3 happen to be non-toxic interspecific hybrids. Then we see an early flowering and fruiting interspecific hybrid exhibiting no visible heterosis. 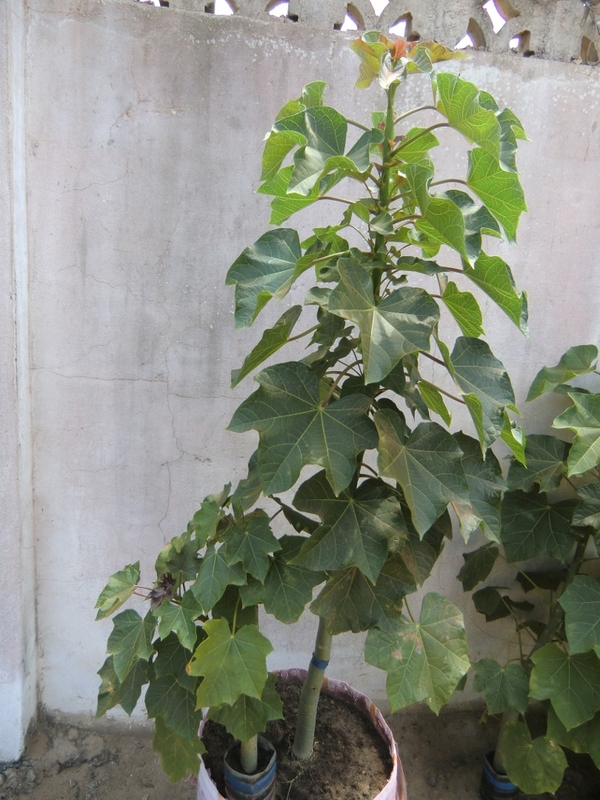 Similarly at last, on the far right some regular Jatropha can be seen. From left to right we go from high level heterosis to none at all. In front a rare chili pepper can be seen which is currently tested for drought resistance. The findings described in this post have been highly unexpected. We are currently waiting for the first seeds from plants exhibiting strong heterosis to mature so we can check seed weight and oil content. Based on the results we will have to decide if we are going to open up a new heterosis breeding route in addition to our current approaches. This entry was posted in Breeding, Genetics, Heterosis, Interspecific hybrids, Intraspecific hybrids and tagged heterosis, heterozygosity, hybrid vigor on August 27, 2012 by Ulrich Riemann. This is really interesting stuff. Do you plan to cross the F1 hybrids (or is Jatropa selfing?) and see what the yield is for F2? I found this when my fellow blogger linked to your blog. I'm curious what the status of efforts to investigate genetic tools for Jatropa (like markers for breeding etc)? Also, how is your company funded? Aren't you exposing company secrets on this blog 🙂 Breeding will be a long and costly process – how will you fund it? Paul, yes we already have F2s for both, interspecific (was a big challenge) and intraspecific hybrids. And a lot of BC1s. Describing the status of genetic tools ready for JcL breeding would fill pages. Markers are available for a few traits including toxicity and we are using them in cooperation with our scientific partners. The genetic variability map in this post derived from genetic marker analysis. In other areas we are actually still the guinea pigs for the genetic experts, the benefit of cooperation is more on their side than on ours. We still are completely self funded, which of course has its limits we are already feeling. We will need to go out and look for funding sooner or later. Regarding company secrets I am steering a fine line. I am trying to remain as open as possible, but there is security for our breeding orchard…;-) Our long term business model is a mix of plantation services and supply of planting materials. We are mainly paid for the services plus a small royalty. What is the cost involved if someone wants to buy seeds from your company. You may send details at asif.seemab@hotmail.com Thanks.